Discussion in 'Hawaii Fishing Reports' started by Startmeup, Jul 14, 2011. Aloha from Lahaina Harbor, Maui, Hawaii. The fishing is always good and the catching part also happens to be good right now. The blue marlin bite is extremely hot and most boats are getting bit on a daily basis. Besides blue marlin, most of the other varieties of game fish are being caught, including shortbill spearfish, mahi, ono, and tuna. If there are any questions about the fishing, feel free to call Deli in Start Me Up&#8217;s Lahaina Harbor booth at 808-667-7879 between 9 a.m. and 5 p.m. and Hawaii Time. Another way to contact Deli is to email [email protected]. The following fishing report contains some of Start Me Up&#8217;s anglers and their catch up until July 6th. This big blue marlin was part of a double bite. The bigger fish, which was caught, jumped over the second line and broke off the smaller fish. Lucas Lange started off in the chair but got out to give his wife, DJ Jones, Andrew Sytsma, and Candace Costello a turn. Lucas then got back in the chair to finish the fight. The fish was caught late in the afternoon and weighed in at 621 lbs. that night. As usual for fish over 500 lbs., the anglers received their trip for free and a 300 dollar donation was made to a local charity, which in this case the Boys and Girls Club of Maui. Bud Hamrick was another angler that recently caught a big blue marlin in the afternoon. Bud&#8217;s 548 lb. blue marlin ate the long rigger purple softhead in 150 fathoms of water on the Kahoolawe side of the factory. Bud brought his fish to the boat 31 minutes after the initial bite. Of course, Bud&#8217;s trip was free and a 300 dollar donation was made to the Boo Boo Zoo, which is a local animal shelter. I, Jonny, apologize for the quality of the next several photographs. Clearly, I am not a professional photographer and cannot determine when a camera is shooting in black and white. Terry Hoffman was the third recent angler to land a big fish on a 4 hour afternoon trip. His 552 lb. blue marlin was definitely a fighter and refused to come near the boat for about 2 hours. In the end, Terry prevailed and secured his catch, a free trip, and a 300 dollar donation to the West Maui Senior Center. When marlin hit the scales at Lahaina Harbor, they usually attract quite a crowd. Terry&#8217;s 552 lb. blue marlin was no exception. Not all the blue marlin caught out of Lahaina Harbor end up hitting the scales. A significant percentage are actually tagged and released. These two anglers experienced the excitement of catching a blue marlin and then the satisfaction of watching the fish swim away in a healthy state. The mahis were nowhere to be found at two buoys and a floating cargo net. Live opelus did entice a single strike but the fish bit through the bridle. Despite their hard luck, these anglers had a great time catching shibis and akus on light standup gear. Trolling also produced two shortbill spearfish bites, but those fish never managed to find the double hook rigs. This shibi was perfect for some sashimi and poke. Who couldn&#8217;t go for some of that right now? Many people try to catch a shortbill spearfish for years without much success. This young angler went out at 12 years old and caught a shortbill spearfish, which is commonly acknowledged as the most elusive billfish in the world. This family did a short trip that combined both trolling and bottom fishing. Trolling produced a big kawakawa, which are normally caught in the 5 lb. range. Among other things, bottom fishing produced a nabeta. Nabetas are a type of sand-dwelling wrasse that taste excellent in the frying pan. The Drost group caught a couple of fat akus while working a bird pile with lures. The anglers took some of their catch with them in order to enjoy some sashimi after the trip. There&#8217;s nothing wrong with going out for 4 hours in the afternoon and catching a couple of mahis. These Nebraskans went out and did just that. Joanne Dowle tagged and released a 200 lb. blue marlin in the middle of the factory. Battling the fish on 30 lb. class standup gear was a challenge so Pete Kilpatrick made sure that Joanne stayed motivated. Catching a 200 lb. fish on a 30 lb. class rod and reel is quite an accomplishment. Way to go Joanne! Jack and Sophia Davidson landed a couple of kawakawas. The kids were excited about their catch. Both tunas hit a 3 inch jet running in the long gone position behind a bird. Josh Grenner was joined by his friends Mike Poor and Todd Allen on a 4 hour afternoon trip. Together, the friends caught a 95 lb. blue marlin that was prepared and eaten in just about every way imaginable. Josh, Mike, and Todd were pretty fired up about their catch. The action kicked off for Brett Reifeiss when he hooked an estimated 250 lb. blue marlin. The fish tore out some line and then settled down, but came off after about 5 minutes. Right in front of the harbor, Brett came across his mercy mahi mahi, which happened to be a nice one. Dave Maginnis came across a very special catch when he snagged a puffer fish while trolling. Dave caught another special fish after a 20 minute fight in 45 fathoms of water off the dump. Dave&#8217;s blue marlin weighed in at 178 lbs. There is no doubt that John Shimota&#8217;s aku was trying to avoid all of the marlin that have been around. Even while faced with that tough task, John&#8217;s aku still found the time to bite a lure. Ryan Cowett, Mark Koziol, and Caidyn Edlund also found some tunas, which they elected to catch on light tackle and have filleted up for some sashimi. Chuck and Judy Price were joined by Kevin and Lori Flores on an eventful 4 hour trip. The anglers had a quadruple bite right off the bat and hooked one more fish on a live opelu. Three of the five fish were landed and the trolling gear was set back up. A short time later, the anglers had a double bite on the long corner and the long rigger lures. They landed one of those fish and tried to entice any followers with live opelu. Chuck, Judy, Kevin, and Lori ended up going four for seven on mahis. As any Hawaiian fisherman knows, averaging a mahi per hour is not too shabby. Anne and George were patient all day as neither live bait or lures attracted the attention of larger fish. They did catch some small tunas for sashimi and then got a good bite right at the end of the trip. The fish ended up being a blue marlin that was bleeding profusely near the boat and was therefore taken for consumption. This father and son had an awesome day on the water. They had a total of six blue marlin bites and each managed to tag and release their own blue marlin. An additional blue marlin swam into the pattern but chose not to bite for some strange reason. Catching two billfish on a single trip isn&#8217;t very common but Charlie Nordquist and Randy Peacock made that situation a reality by catching a shortbill spearfish and a blue marlin, respectively. Charlie and Randy only needed a striped marlin to complete the Hawaiian billfish slam. The Messick family had a great afternoon and caught this shortbill spearfish. The fish bit a Jr. Softhead running in the short rigger position while the Messicks were trolling the area inside LA buoy. This group of happy anglers was rewarded for venturing up to Molokai. They had a triple ono bite and got all three fish. The triple ono bite might have actually been a quadruple bite as another lure was later found to be chewed up. Jeremy Delatorre was accompanied by his father on a 4 hour trip and caught a 178 lb. blue marlin. Jeremy&#8217;s father was on island visiting Jeremy, who is part of the Maui Police Department. Jeremy and his father described the fishing trip as the experience of a lifetime. John and Ellie Gettigan, Chris Ellis, and Lasse Lindquist had an action packed day while fishing the north shore of Molokai. They put some tuna, mahi, and ono on the boat while using mostly live bait on 30 lb. class standup gear. The tunas were in the 40 and 60 lb. range. Hank and Dave Allston went out on a thrilling 4 hour afternoon trip. Hank and Dave were hooked up to an estimated 400 lb. blue marlin for 20 minutes but had to settle for a mahi. Thanks for taking a look at this Start Me Up fishing report. Any questions can be directed towards Deli via telephone at 808-667-7879 or via email at [email protected]. Until next time, tight lines. Nice! Those big blues are impressive. It's nice to see big smiles on the faces of our VIPs! Looks like you guys are still putting customers on fish. Good Job! Thats cool how you actually name what charity the donations go to now. Way to help the needy in a time of hardships. Looks like the Putnam bros are still catching fish.........nice! You guys are killing me! I won't be there until late August. Can't wait to go out with you again on the 9 hour trip. Fish till your arms ache! Thanks to everyone at Start Me Up (Steve, Yukka, Deli) for an amazing fishing trip. 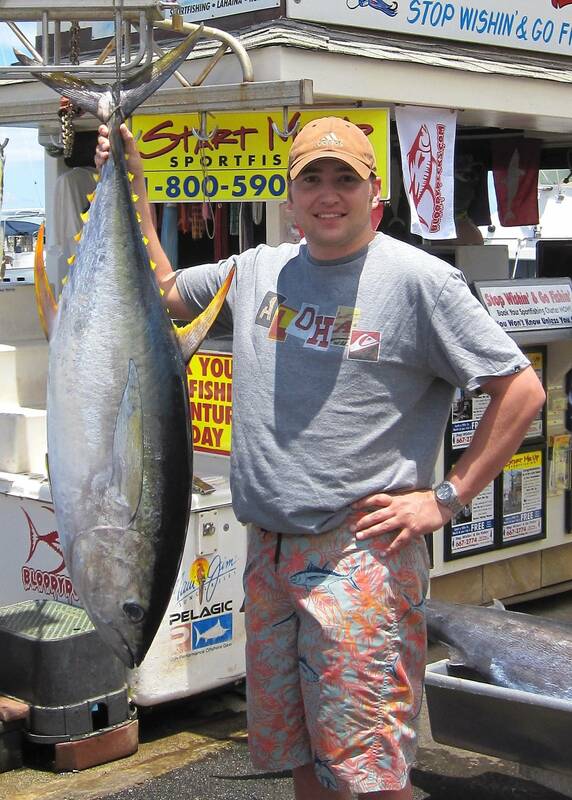 This 68 pound yellowfin tuna was caught on a 9 hour trip off the coast of Molokai. I highly recommend fishing with these guys. I have fished all the Hawaiian Islands and these guys are above and beyond the rest.